Clear winter skies provide exquisite views of the Japanese Alps which are often masked in a slight haze throughout the warmer months. This circumstance was taken advantage of on this latest outing which truly conveyed the majesty of Mt. Fuji. Although a somewhat underrated hike, its location just inside Yamanashi Prefecture provides splendid views of Mt. Fuji from two prominent peaks. The hike begins at Torisawa Station 鳥沢駅 taking around 90 minutes to reach from Shinjuku. From the station head across the street which leads under the Chuo Expressway. The road then loops around to the left and back up the hill near the Otsuki Country Golf Club. Along the road shadowing the golf course look for a sign on your left 梨の木平 Nashi no kihira allowing you bypass a section of road. A further 10 minutes after exiting back onto the road you should arrive at the trail head on your left side. The route from the station is generally well marked with several signs pointing you in the direction of Mt. Ougiyama and takes approximately one hour to reach this point. At the trail head there are toilet amenities and some benches to sit down as well as map of the area. The trail to the summit of Mt. Ougiyama 扇山 (1,138 m) is interlaced with switchbacks to ease the climb though becomes steeper over the last section. After about a 30 minutes there is a water hole to fill up. At the ridgeline 大久保のコル Ookubo no koru turn right towards Mt. Ougiyama. From here it is about 10 minutes to the summit. Arriving at the summit of Mt. Ougiyama there was a fair amount of snow and pretty much devoid of hikers, though more importantly stunning views of Mt. Fuji were to be had. After taking a short breather head back down the ridge to Ookubo no koru where the trail maintains a gradual decent. This section of trail receives a fair dusting of snow cover through the winter and is advisable to carry some ski poles to steady your footing. After around an hour you will a see metal pole with a red arrow (unlabelled) where you turn left for the final and at times rather steep ascent to Mt. Momokurasan 百蔵山 (1,003 m). While the peak of Mt. Momokurasan has tree cover, excellent views are afforded towards Mt. Fuji and Otsuki City and makes for a well-deserved lunch spot. When you’re ready to head off, continue in a westerly direction across the summit for 10 minutes where you should find a marker on your left which heads towards Saruhashi Station 猿橋駅. More views of Otsuki City are provided and a water hole is situated around half way down. When you arrive at the parking area and small shrine take care not to follow the winding road, instead look for a narrow road which begins at the bottom of the stairs. From the car park it takes around 40 minutes to reach the station. When the narrow road converges turn right onto a main road which passes an athletics field, further down cross over a bridge and head back under the Chuo Expressway. The station is located right of the 7-Eleven on the opposite side of the pedestrian bridge. Again look for well-marked signage pointing you in the direction of the station. This is Lyn again, the one hoping to hike around the Tokyo area in December with my family of 5. We’ve made arrangements for the Tanzawa Traverse, but are still trying to decide on the 2nd hike. As we will be staying near the Minami gyotoku station, the three hour travelling time to get to the start of the Mitsuge- toge -yama hike is rather daunting, so I am considering the Mt Ougiyama hike instead. Would it normally be do-able in early December? In your experience, would light crampons be necessary when doing the Tanzawa Traverse early December (2-3 December)? By the way, I found your hiking trails, with all the waypoints embedded, really helpful. Thanks for sharing all your input! I know Minami Gyotoku as I used to live nearby in Kasai and is nicely located if you’re planning a day outing with the family to Tokyo Disneyland. As for Mt. Ougiyama in early December there is likely to be little or no snow so it’s certainly do-able. The same goes for Mt. Tanzawa at that time of year the summit is usually snow free though it will be cold. I just had a look at last year’s temperatures at Miyama-sansou and for early December night time averages are around -5℃ and daytime about 5℃ so please pack accordingly. Regular hiking footwear is fine for both hikes so no need for crampons. Thanks for the advice about the cold up there. We will certainly pack coldwear along. It’s good to know crampons won’t be necessary. We actually chose the apartment near Minami Gyotoku for its spaciousness rather than its nearness to Tokyo Disneyland. Would there be any other hikes nearer to Minami Gyotoku that you would recommend? I tried to find accommodation nearer to Shinjuku but most were too small or very expensive. Your input has really been much appreciated. Chiba’s most famous hiking spot is Mt. Nokogiri but unfortunately quite far from where your staying. Equally there is a great campsite at Uchiurayama Kenmin no Mori near Katsuura with around 50 campsites and plenty of lodges to stay. Failing that I would definitely recommend grabbing some bikes or walking down to the Kasai Rinkai Koen which is a lovely place to spend the afternoon. Thanks for your suggestions. Uchiurayama Kenmin no Mori looks very interesting! I was searching for good hiking trails near Tokyo for late December (around Christmas) and I stumbled on your link “The best day hikes around Tokyo”. And out of all those Mt Ougiyama looks amazing. So I was wondering if the trail is open in late December? And any special gear is needed hike it. Hi Ravi, yes the Mt. Ougiyama trail is open year round. I just checked my notes and I hiked it on December 28th last year and while crampons aren’t necessary there will most likely be a fair amount of snow, just to be safe I would recommend taking along some trekking poles. Thank you very much David. Really appreciate your guidance. Hi David, I hiked up Mt. Ougiyama on Jan. 27th, 2015. While the climb up was snow-free, crampons were definitely needed on the descent down the north-facing slope. Ditto for the mountain on the opposite side of the valley, Mt. Kuradake, which I climbed one week earlier. Having poles also left me feeling that I was more fully in control. Wise decision Patrick bringing along the trekking poles as they definitely provide extra stability and confidence when needed. I just want to say thank you for all the information on your site. Without all the pictures and the description I would have been not brave enough to go hiking around Tokyo, because I cannot speak any Japanese. But so I had one wonderful day with the tour for Mt. Ougiyama 扇山 – Mt. Momokurasan 百蔵山 yesterday. And two weeks ago another tour to Mt. Hinodeyama 日の出山 – Mt. Mitake 御岳山. The weather was perfect, some people but not to crowded. Hey Julius, I’m so pleased that you had a great hike. This is one of my favourite times of year for hiking with crisp cold mornings and few people out and about on the trails. I really appreciate the feedback also. Thank you and all the best. How do you check the weather forecast of these 2 peaks. I am unable to find forecast for the mountains in google or mountainweather sites. Is it enough if I just check the yamanashi-shi weather ?? Thanks for the recommended hike and details. Just went today and was not disappointed – views were great! I saw another hiker about every 10 minutes and there were 5-6 groups at the summit of Mt. Ougiyama. There were about half as many people on Mt. Momokurasan. Your descriptions and map were helpful, especially when the map was viewed with “terrain” turned on to show topo lines. There was a slight discrepancy for the left turn marker 10 mins down from the peak of Mt. 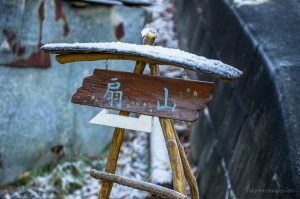 Momokurasan – the marker was on the right (not left), marking the trail which T’s in from the left, and it was a couple hundred meters past where your GPS path seemed to turn left. It made me wonder for a few minutes, so I thought I’d point it out for the next person… Thanks again – great hike! Glad you enjoyed the hike and you certainly picked an awesome day for it. Thanks for clarifying the discrepancy in the trail notes also. Nice blog mate! Especially digging the haikyo stuff, and Mt Ougiyama looks great, I’ll put it at the top of the list for my next visit to Tokyo… I hiked Kuratake last time, which was nice but no Fuji view that day. Anyway, I don’t think I can fit in a 6 hour hike out there (including the travel time) when I come back, but 3 hours I can do so just wanted to ask what you’d estimate the hiking time to be to go straight up & down Ougiyama without including Momokurasan? 3 hours enough? Hi Simon, thanks for the compliments. As for Mt. Ougiyama while it isn’t a particularly strenuous hike I would allow for around 3-3.5 hours to get up and down comfortably. Firstly, many thanks for putting your time and effort into this website. It will literally make our time in Tokyo/Japan a more enjoyable experience. After moving here in June, last week we did this hike as our first hike in Japan, and what a great first hike it was. Perfect late autumn/early winter weather. We only saw 2 other groups the whole day. And your rating of moderate was about right. The only dampener was that Mt Fuji was clouded over, which I understand is not unusual. a) I think the numbering of some of the Mapple Mountains & Highlands topographical maps you reference has changed, i.e. the Takao & Jinba map now appears to be 28 rather than 27.
b) Do we really need to concern ourselves with the bears? And if yes, what’s the practical approach (I certainly don’t want to pierce the peace & quiet by carrying a bell around everywhere). Thanks for your comment and clarifications. I hadn’t realized but it appears that the Yama-to-Kogen map numbers have indeed been revised, so I appreciate the heads up. Regarding bears, the probability of coming across one in the Kanto area is fairly slim so I wouldn’t worry about it. In lieu of a ‘bear bell’ a better approach to is to make a little noise when you’re out and about so as to not surprise them. Yeh, it looks like it may be just one of the maps that has changed number. Suspected as much with the bears. One more question: What 1 or 2 day hikes near Tokyo (no more than 3 hour drive) would you recommend over Jan/Feb/Mar, if any. Happy to use crampons + walking axe in some sections if required. Look forward to providing some more feedback on future hikes! !